It gets a little crazy around here. Between Joe’s obsession with healthy living and Nick’s constant indulgence in fast food, even bringing up what was for dinner last night can be a hot topic. Add in Matt’s aversion to most of the restaurants in town (except for that one place) and you quickly learn that some topics are best avoided. Whether it’s listening in on heated discussions about the Spartan’s football season or learning the story behind the Cold Oatmeal podcast name, nobody could accuse the Resch Strategies team of being boring. For six months, I’ve had the privilege of working as an intern with this team. My time here allowed me to see how a skilled public relations firm functions and it has been an incredibly educational experience. It’s difficult to sum up, but here are the most important lessons that I’ve learned. Writing is a skill that is cultivated over time. The staff here have been writing for years, and that experience shows. Each team member has a unique style and is all but immune to grammar mistakes or errors in punctuation. When I send through something I’m working on, I know it will come back full of edits. I’m thankful for their critiques though because I’m still learning. With every red line through my work, I learn from my mistakes and improve as a writer. It’s impossible to be an advocate for a client without putting in the time to research. Whether that means doing industry research for a new client or understanding their opposition’s latest proposal, research is essential. Whenever I started a new project, I was always encouraged to ask questions and take time to research. Collecting background information gave me a clear idea of everyone’s expectations and a foundation for future projects. As an intern, expect to do the work that no one else wants to do. Even the most dull and monotonous tasks help contribute to the bigger picture. When I was assigned a boring task, it always came with an explanation of how the work was helpful to our client. The explanation made me feel better, knowing I wasn’t wasting my time on something that wouldn’t be valued later. No matter how it might seem, even the little stuff is important. Keep track of everything. At the end of this internship, I am walking away with infinitely more experience and knowledge than I went in with. Throughout the internship, I made sure to save all of my work and not lose track of the pieces I was most proud of. Keeping everything organized as I went made it easier when I wanted to pull together new pieces for my portfolio. Now, my portfolio is full of work from this internship, all organized and ready to impress future employers. A little bit of feedback can go a long way. Just because I’m out of college doesn’t mean I’m done learning. Being a part of this team has been great because everyone takes the time to share their opinion. What I did wrong, what I did right and the little tips that make the job so much easier. Internships should be considered a learning experience, and having a supportive team can make a world of difference. 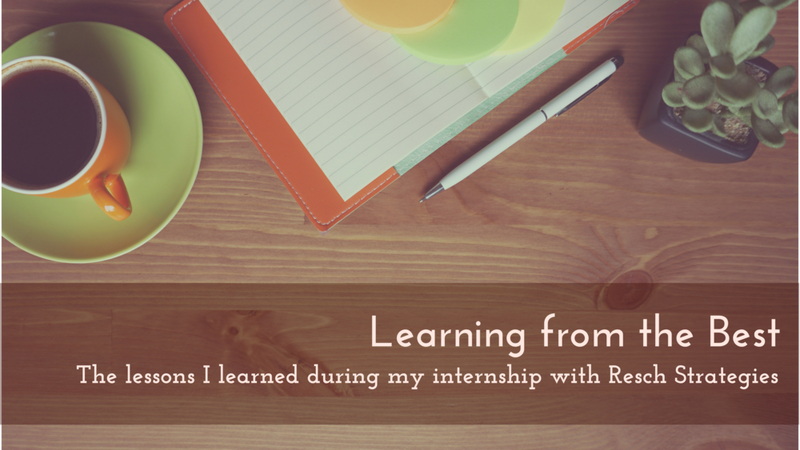 My internship with Resch Strategies gave me the tools I need to succeed and opened my eyes to the possibilities this field offers. I can’t thank Matt enough for giving me this amazing opportunity to work with a team that has so much talent and knowledge.